Since the weekly and daily uptrends pushed us higher, we now face a conundrum. Is this a great chance to rejoin the monthly decline that recently caused a gigantic fall in this pair? Is this a great chance to go long and aim for really high targets once breaking above resistance at 1.31? Fundamentals seem to suggest fears of bears are overblown, and Canada is in much better shape than traders give it credit for. Positioning shows hedge funds have been net short since July 2017, and gradually covering shorts until now. Most of the unwinding happened after we closed over this area where stops where waiting, most likely, and is almost dont, since they are close to flat according to the Commitment of traders report. This observation had escaped me, when I made the previous chart, could make a big difference, if we encounter sellers at the monthly resistance around 1.31. If not, the short unwind might take us higher, but it is unlikely given that it would take time to break the resistance, and this would nullify the squeeze thesis. I closed my longs and I wait to short around the 1.31 mark. This would be a position trade, so, we won't use a stop and size the trade to risk 1% of our account with a very wide invalidation for the trade to give room for volatility . As a bonus, oil seems to have gained support thanks to the situation in Venezuela lately, and the chart we now have a new weekly mode for a possible contiunuation of the weekly and monthly rally. Upside in oil is significant, but it's risky to trade it, compared to this trade in the $CAD. Price rejected from the monthly level. I will average in for the other half gradually. I'll be looking to enter a daily short as well, with a tight stop and low risk additionally. I added, will add to shorts in the next 2 days as well as placing a separate short term entry with a tight stop today when confirmed in the hourly chart. Added another position after breaking under a previous low. 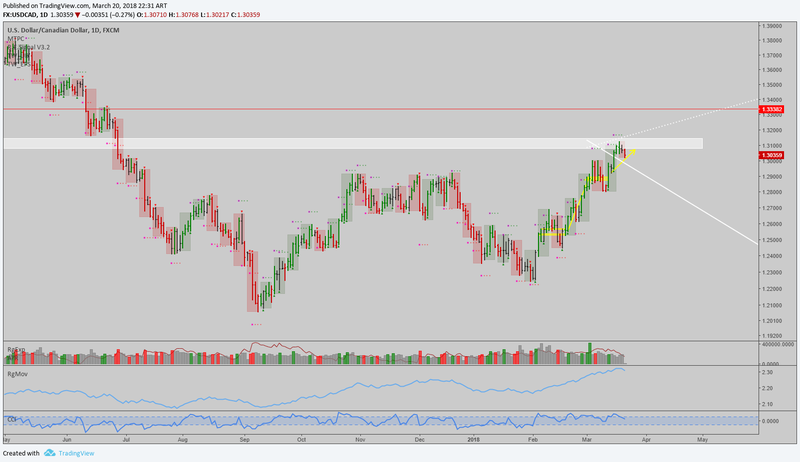 評論: Also shorted $EURCAD with a tight stop and small risk. 手動結束交易: I banked here and will reenter after FOMC today, I suspect we might make a higher high, and get an even better entry short. Nice little 0.15% gain. I'm short with a cost basis of 1.28884 for the long term position, we had covered with a profit of 0.12% before. Looking to take additional shorter term trades with tight stops on the way down, here we have a possible daily opportunity in the making. This could take a break and retrace, I'm out with a nice gain. 交易進行: Reshorted since support didn't hold. Sadly closed before hitting the target on a fake out but target hit nonetheless, should monitor it to see if it acts as support, or if we get a new trend continuation signal to rejoin the downtrend. 評論: Reshorting after today's close, breaking today's low is a good but conservative entry. Target zone for the retrace hit, added to short. I'll add some more for 2 more days after today. 評論: Price already down from the resistance we tagged today. Add on in profit, first entry not yet. I'll add two more entries in the next 2 NY sessions. 交易進行: You could reshort today, shame I missed the entry near the top, but I forgot to set alerts for this pair...oh well. Can reshort on retrace after today, but it is a bit worse risk reward. Shorted once more, tight stop possible, long term entry also valid with stop above 1.32 zone. It's worth a try, considering the potential reward. Cost basis is around 1.3023. 手動結束交易: Trump literally rescued the dollar here, for now...not clear if it's going to hold up, but it certainly is problematic for our trade. I'm covering the short now to be safe. No point in giving up all profit, potentially. It could be a bear trap as well, but, not worth finding out while in the trade. Reshorted with 1/2 position at market open. 手動結束交易: Banked my shorts for a 0.39% gain. I'll wait for the Fed to act. Placed a sell stop, if we break down I'll short here. @I_see_BTC, it did ok so far. Let's see if oil makes a higher low or two and accelerate higher in the next few days. That would certainly help. @BernhardAnalytics, it's just a target in the monthly. As we move lower and lower, we reasess. You know how trends work. @aa2016, thanks! Hopefully we do confirm the drop breaking lower tomorrow, I think the yields rising got to a peak where people freaked out...many calling for a bottom in $DXY but it could very well be a top for now. Overall, $CAD has room to catch up to oil, so we have a lot of upside in this trade probably. 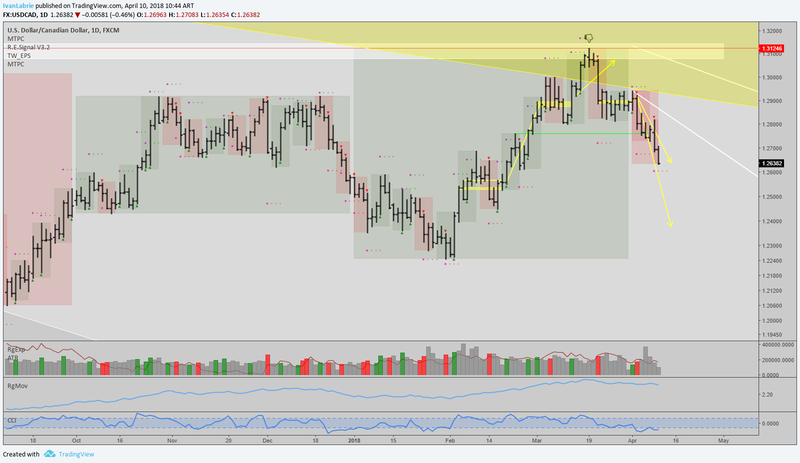 what was the main reason of all this bullish run for USDCAD? @aa2016, the reason is probably rate hike fears. I covered the short and avoided losing money here. The time at mode trend in the daily did warn us, since targets were hit, price could reverse briefly...we need to wait to confirm buyers lose steam, to eventually reshort. You're flat?